Calamondin Marmalade for sale. Buy online at Zingerman's Mail Order. Gourmet Gifts. Food Gifts. The most exquisite and rare marmalade I've ever enjoyed. Robert Lambert began his 30 year career in food as a pastry chef. Today all his attention and passion is focused on his company and creating unique products like this exotic marmalade. 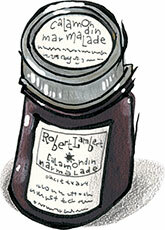 Actually, all his marmalades are exotic, but this one really blew us away. Calamondin is a citrus fruit I’d never heard of. It’s a lime-sized sour orange—think of a large kumquat and you’ve got it—that Robert sources from a friend of his that collects citrus trees on his forty acres in Watsonville, California. The yield of the fruits is never large, so Robert only makes small, limited quantity batches. Robert makes all the products himself. To keep up with demand, he works 7 days a week, 12 hours a day. What sets his marmalades apart are the extra measures (and costs) he passionately believes make the difference. Instead of cooking the fruit in water, Robert cooks all his citrus in a mix of fruit juice and water. It costs more, but the result is a really intense flavor. I mean really excellent. Bright, prickly, almost spicy, the flavor lingers and tastes somewhere between a mandarin, orange and lime. Unlike any marmalade you might have enjoyed and definitely something for the Instagramers and bloggers of the world to boast about eating. Be the first on your block to experience how amazing great marmalade can be.